Arcubisite (Ag6CuBiS4) is a sulfosalt mineral occurring with cryolite in Greenland. Optical properties and chemical compositions are given; X-ray crystallographic data could not be obtained due to insufficient material. It’s named after its composition (Argentum, CUprum, and BISmuth). It is not radioactive. Name: For the composition – Argentum (silver), Cuprum (copper), and bismuth. Morphology: Anhedral grains to 0.05mm. This mineral occurs associated with Te-canfieldite, berryite, hessite, argentite and native bismuth in matildite- and aikinite-bearing galena, intersected by drill hole A in the uppermost part of the quartz body of the deposit. 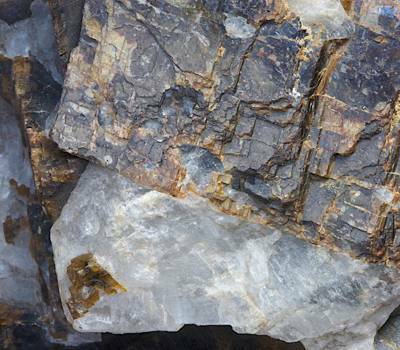 Arcubisite has also been found in extremely small amounts in two specimens from the fluorite cryolite. The minerals are considered to have crystallized penecontemporaneously with the galena host at temperatures below 230°C and at a pressure of around 2000 bars. Association: Galena, hessite, aikinite, matildite, berryite, tellurian canfieldite, acanthite, bismuth, quartz, fluorite, cryolite. Distribution: From the Ivigtut cryolite deposit, southwestern Greenland [TL]. 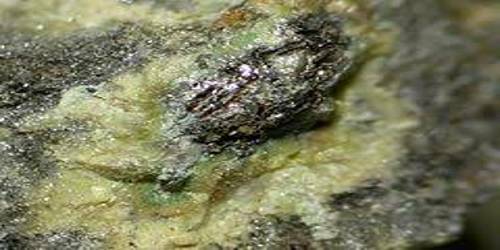 Name: For the major metallic elements in the mineral: Argentum, silver; CUprum, copper; BISmuth and Sulfur.